The Royal Air Force says that more than 60 improvements have been made to this second Rivet Joint aircraft compared to the first, and that it will be operational in a matter of weeks. As part of its Airseeker Programme, the second signals intelligence aircraft has been delivered to the RAF, seven months early, the MOD has announced. The specialist surveillance aircraft was handed over today at RAF Mildenhall in Suffolk and will be deployable on operations within a matter of weeks. Since delivery of the first aircraft last year, over 60 improvements have been incorporated into the second aeroplane ranging from upgrades to the aircraft’s mission systems to engine improvements providing increased fuel efficiency and durability. The first Airseeker commenced operations in July 2014 and is currently employed alongside other RAF units in the fight against ISIL supporting operations in Iraq and Syria. In due course, it will undergo an upgrade programme to bring the aircraft in line with the improvements made on the second aircraft. Defence Secretary, Michael Fallon, said: “The delivery of the second Airseeker provides our Armed Forces with another vital intelligence aircraft that will give valuable support to our fight against enemies such as ISIL. The Airseeker not only gathers data and vital intelligence using advanced sensor technology, but it is also able to carry out onboard analysis and distribute the information to be exploited by assets on the ground via its high-tech communications suite. 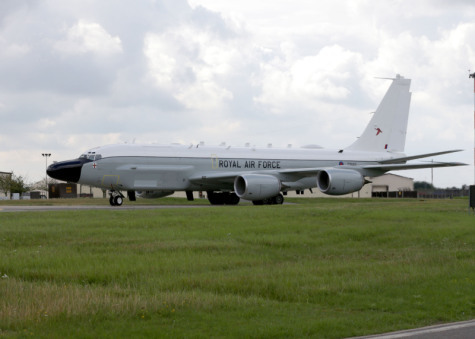 The aircraft is part of the MOD’s Airseeker capability and is one of three aircraft that is being bought from the US. Airseeker complements the RAF’s Intelligence, Surveillance, Target Acquisition and Reconnaissance (ISTAR) Force, which includes Sentry, Shadow, Sentinel and Reaper as well as the reconnaissance capabilities of our fighter aircraft. The 3 aircraft, converted by L-3 Communications in Greenville, Texas, from Boeing KC-135 tankers, have been bought directly from the US government at a cost of around £650 million. This includes provision of ground infrastructure, training of personnel and ground supporting systems. The third aircraft is scheduled for delivery in 2017.